This cake started innocently with a simple, basic vanilla cake made in a tart pan, and then a custard whipped cream on top. But something happened along the way when i realised that there are some of my favorite kinder maxi bars lying in my kitchen shelf. 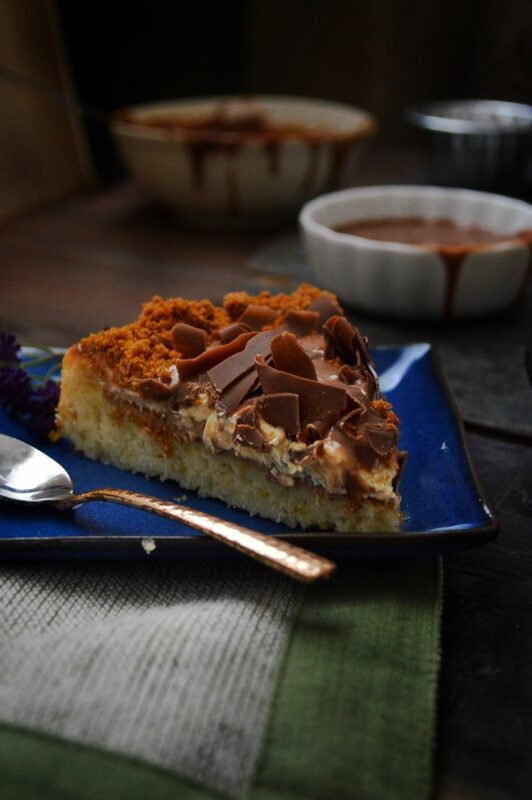 So i quickly made a nice thick ganache out of the kinder chocolates and kept it far away from my sight till i was getting the cake and the pudding ready……maaaan, the ganache tasted so damn good that i would have finished half of it before i completed the recipe. 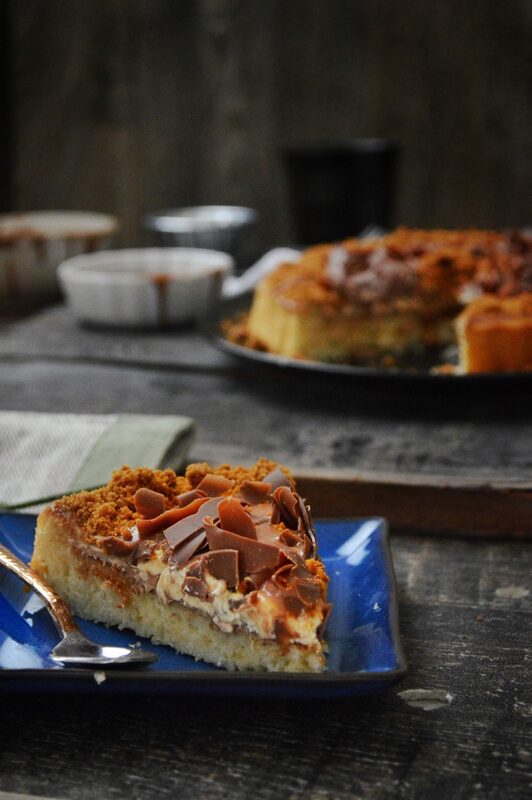 The cake recipe is so so very simple, that you can just whip it up in 10-15 minutes. Perfect type of recipe when u don’t have enough time in hand, or like me, when you have a crying baby who is holding your leg and not letting you move around. The cake just takes 20 minutes to get baked. Meanwhile, you can make the pudding part, which is again very simple. 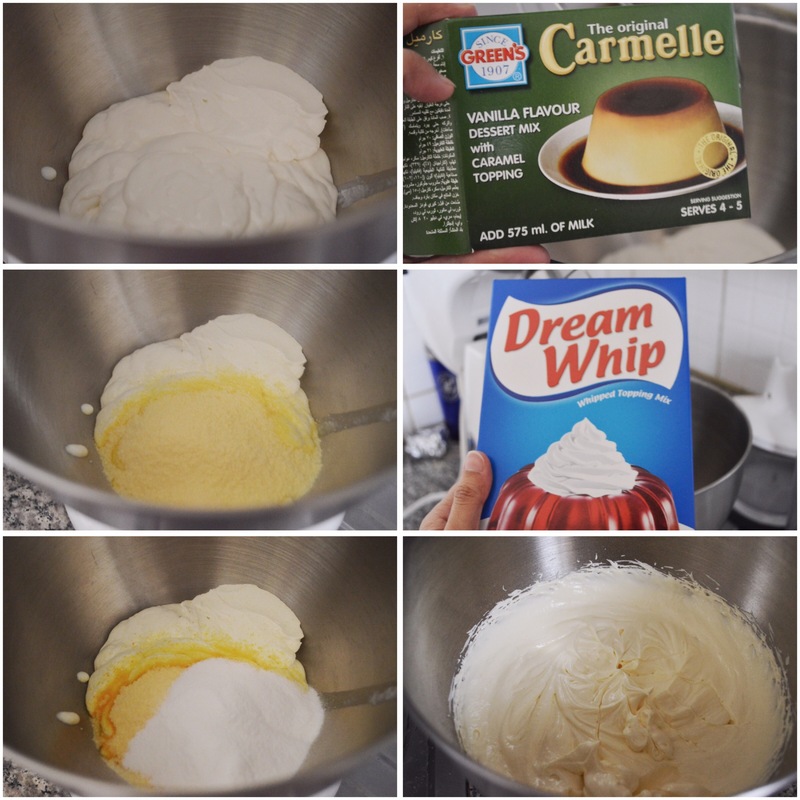 Take your electric beater and with the whisk attachment, just whip nestle cream, whipping cream powder(dream whip) and the caramel custard powder till you get stiff peaks. 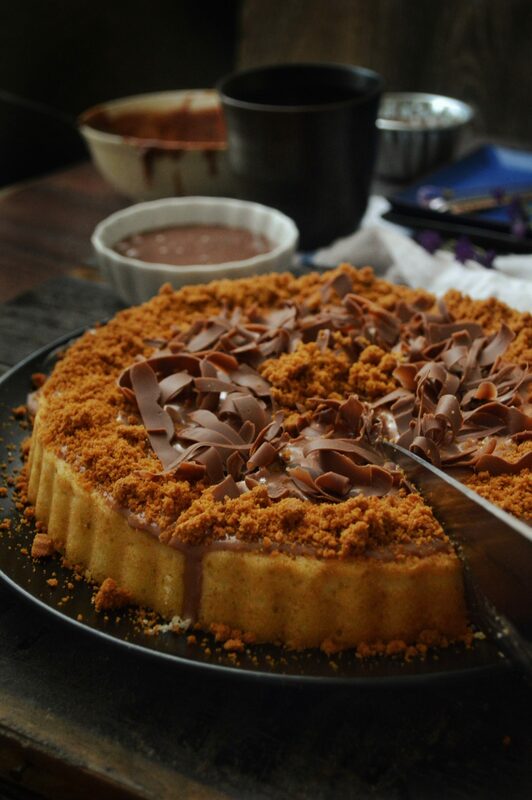 Then just assemble the cake by adding a little ganache as first layer, then cream and finally lots of ganache on top. Garnish it with crushed lotus biscuits and chocolate shavings. ✔️ You can replace the buttermilk with regular milk. 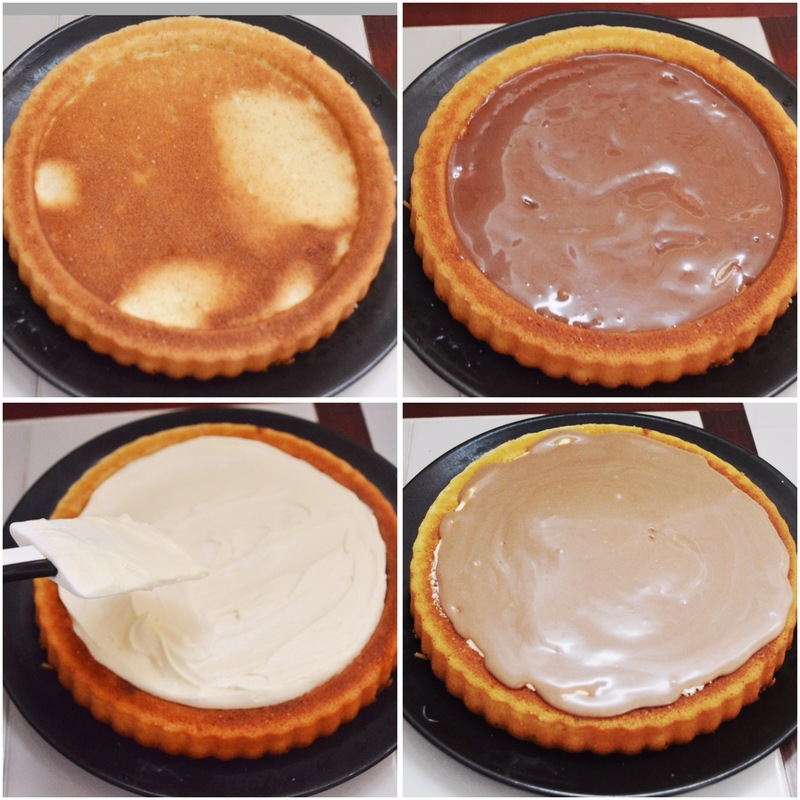 ✔️ Make sure you make this in a tart pan like the one in this picture, so that the cake can hold the pudding. If you can’t find this type of pan, its ok, just make in a normal round pan. If you want the cake to hold more pudding, scrape out a little cake from surface to make a well, keeping the sides as such. ✔️ If you cant get kinder, just use the usual chocolate. But i must say that it tastes too good with kinder. In an electric beater, beat the eggs, sugar and vanilla essence till creamy. Add in the oil and beat. Sift the flour, baking powder, and salt. Add the flour mix to the batter slowly alternating with buttermilk. Nicely grease a 24 cm round tart/pie pan. Pour the batter into it and bake for 20 minutes till toothpick inserted comes out clean. Heat the whipping cream till it comes just to a boil. Pour this over the kinder chocolates. Cover it and let it stay for 5 minutes. Combine all the ingredients in a bowl and whisk till stiff peaks form. Onto the cooled cake spread a thin layer of ganache. Then custard cream. Then on top pour plenty of ganache. 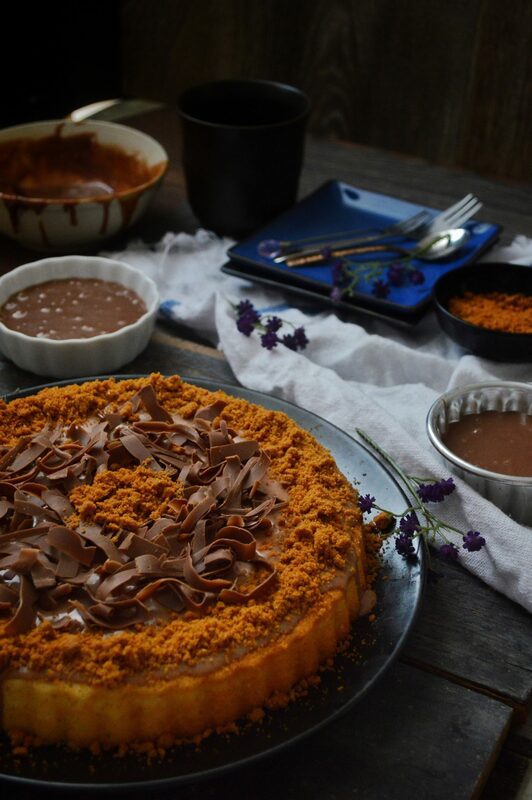 Garnish with crushed lotus biscuits and chocolate shavings. 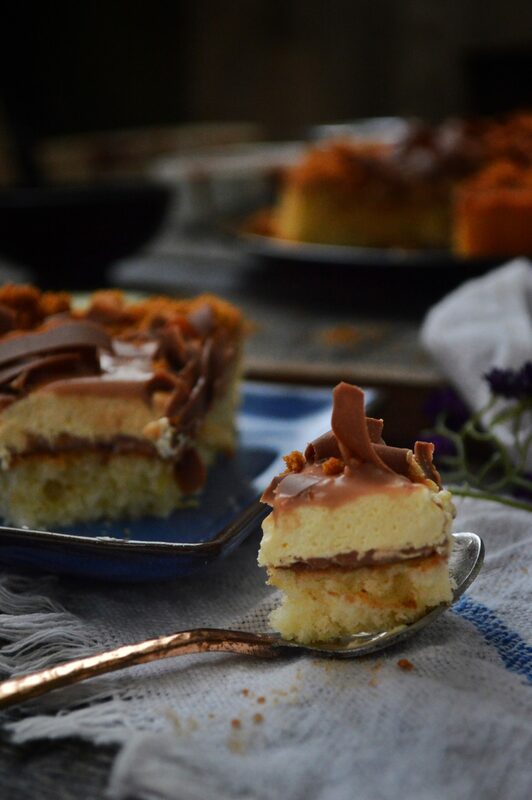 A simple, basic vanilla cake made in a tart pan, with a custard whipped cream and kinder ganache on top. * You can replace the buttermilk with regular milk. 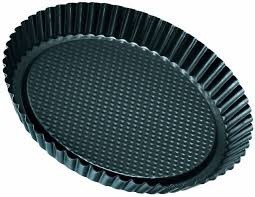 * Make sure you make this in a tart pan like the one in this picture, so that the cake can hold the pudding. If you can’t find this type of pan, its ok, just make in a normal round pan. If you want the cake to hold more pudding, scrape out a little cake from surface to make a well, keeping the sides as such. 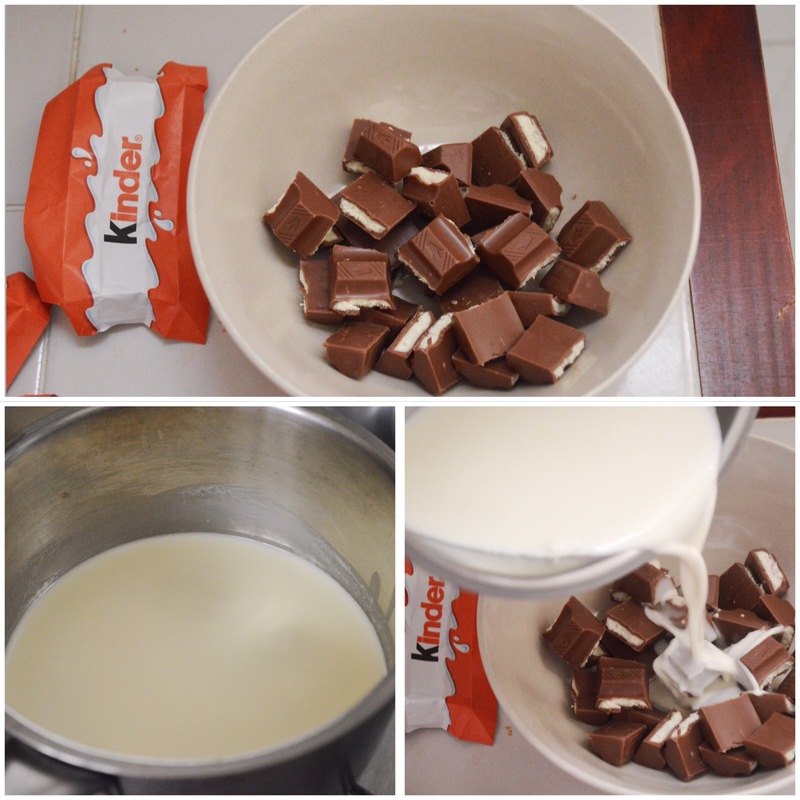 * If you cant get kinder, just use the usual chocolate. But i must say that it tastes too good with kinder. My jaw dropped at the pictures!! Beautiful recipe to share!! I love the purple flowers, the table setting and of course the cake! yumm!!! 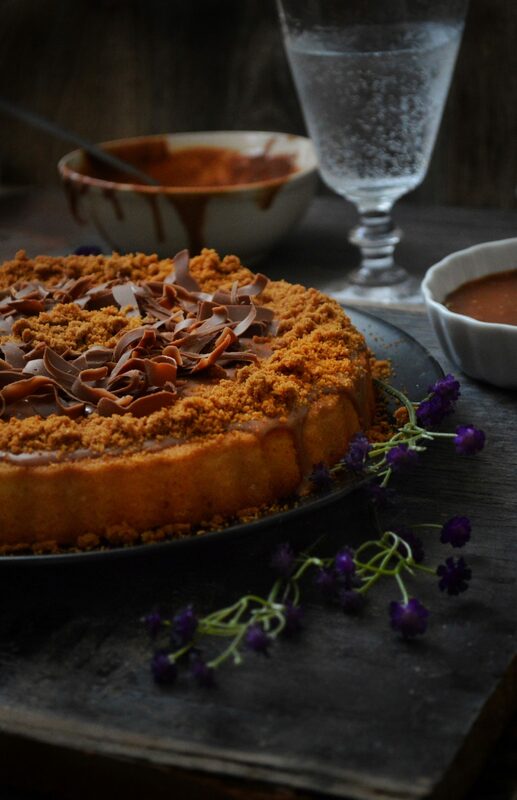 what a decadent dessert – it all looks incredible. Lovely styling and photos, too. 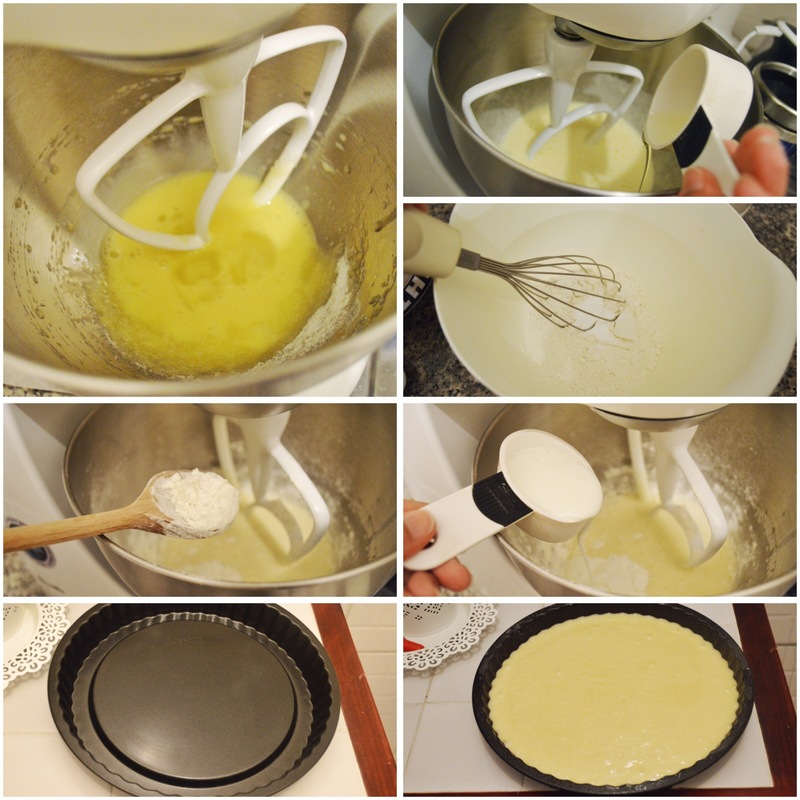 Just gorgeous, I have a similar tart pan but I can’t tell if yours has a removable bottom? Thanks Loretta! no dear my pan doesn’t have a removable bottom. Regarding buttermilk….where is it readily available in kuwait? Yeaah buttermilk is easily available all over Kuwait. They call it laban here. Fresh laban. Hello .. I must really say a big thank u ….I tried this out…and it was a crowd pleaser….and also like your new design of your blog…. classy I would say!! Ma Sha Allah the cake looks amazing..! Hi Sadia, Whats the substitute for Lotus Biscuits please. I live in Australia. Thank you. You can replace it with any other tea biscuit or you can omit it altogether. I just used lotus biscuits for garnish here. Hi Sadia, do you think if I did a chocolate cake instead of vanilla it would taste as good as your original recipe here? There are not many takers for vanilla in my house. I thought I will borrow your chocolate cake recipe and follow the rest of the instructions here for the pudding cake. Do you think that these flavors will complement each other? Lemme know how it turned out for you. Amazing!! Love the shaved chocolate on top! Enikku vayya! 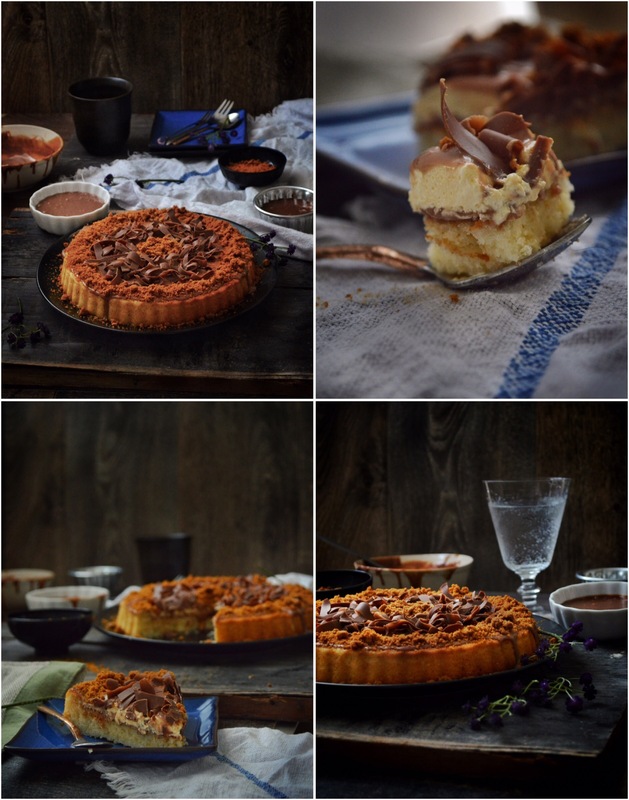 I feel like running away and crying in the corner… buhuhu… 😛 Looks fantastic, Sadia… this must be a riot on the tongue! Thanks a lot Rafeeda! Oh yeah this is good.